Everyone likes a massage, but not the kind that comes as a result of road vibration through the steering wheel. Tired of fighting your car when you are trying to drive? You may need a wheel balance and alignment to solve the problem. There are reasons that a wheel balance and alignment can make your driving experience more comfortable. • Keep you comfortable and safe. 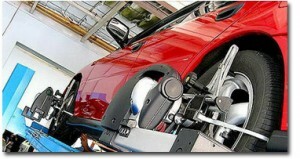 Did you know that a wheel balance and alignment can make a difference in your driving experience? There are enough things to fight in life – your steering wheel isn’t one of them! A proper wheel alignment and balance can create a smooth ride and can prevent blown out tires which can cause you to lose control of your car and have an accident. A simple wheel alignment and balance service at the Fairlawn Rad Air Complete Car Care and Tire Centers can prevent this dangerous situation. • Save money on gas. Though an improperly aligned wheel system may seem like no big deal, it can cost you additional money in gas. Believe it or not, when your tires are properly aligned, you can actually save money at the pump. Studies have shown that out of balance tires travel farther than the tire on the other side of the car, as much as an additional half mile. A wheel balance and alignment can solve this problem. • Wheels need maintenance. Maintaining the balance in your wheel system is not a one-time service. Potholes, surfaces that are being repaired and off-road conditions can throw off your alignment. When in doubt, schedule, a wheel balance and alignment every 12,000 to 15,000 miles. Maintaining good wheel balance and alignment can make your ride comfortable and safe. If you have questions, let us know! The auto mechanics at the Fairlawn Rad Air Complete Car Care and Tire Centers are ready to help you smooth out your ride.